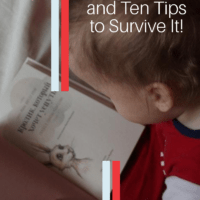 Toddler Sleep Regression And 10 Tips To Survive It! Getting our baby to sleep through the night is important for their health and our own sanity. You forget just how nice it is to sleep more than 4 hours a night and then teething comes along! Once you get past this stage they become a toddler. Their sleeping schedule changes and they begin to nap less. Many toddlers will go through an 18 month sleep regression. Of all the small stages your growing child will go through, many parents say this one is the worst! However, there are ways to face it ─ and survive! 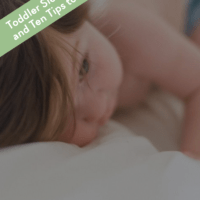 On this page, we’ll discuss toddler sleep regression and give you 10 great tips to cope with it. 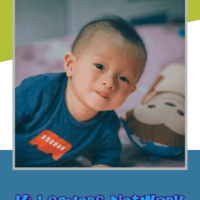 What Is Toddler Sleep Regression? 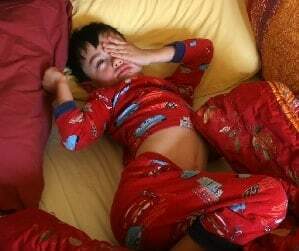 “Sleep Regression” simple means your toddler will no longer keep to their established sleeping pattern. Your toddler could go from sleeping just fine to reverting back to a newborn (hence the term “regression”!). 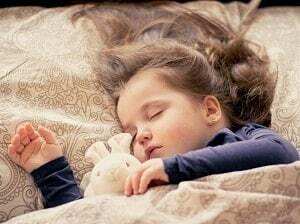 Many parents notice that they’ve toddler’s sleep patterns deteriorate between 18 months and 2 years old. The online parenting groups are full mothers reporting 18 month sleep regression, so take solace in the fact that it’s common and you are not alone! 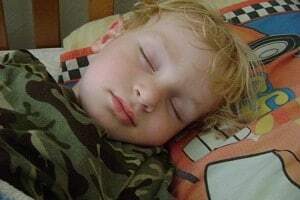 Some experts believe toddler sleep regression is due to learning independence and defiance. Along with becoming more independent, your toddler is learning to say “No” to mommy and daddy. Unfortunately, this rebellion often carries over to sleep time. This time of learning and independence is not all bad. Your toddler is becoming more aware of the world. Speech improves rapidly and they can do simple tasks like eating with a spoon and putting shoes on. It’s actually quite an exciting time in your child’s development! As all mothers know, a toddler without any sleep is prone to tantrums and being generally irritable. When you don’t have sleep as well, it’s sometimes hard to cope with! 1. A Sticker Book or Chart! Most toddlers love stickers so you might be able to use them as a reward program. Tell yours that they get one sticker for their sticker book each time that they take their nap or go to bed on time. 2. Create Bedtime Routines and Stick to Them! Make sure your routine is consistent and has a definite end point such as singing the same song each night. Make sure that your routine is strong as well as consistent! By completing the same routine each night- the same way each night- with the same end point, it will create a strong signal that when the routine ends, it is now time for sleep. Find a cozy and soft item such as a blanket or stuffed animal that will accompany your child to bed each night. If your child has a comforting item that is soft and cuddly, it might minimize how often she yells out for you during the night or how early she wakes in the morning. Don’t depend on certain times for naps or bedtime. If your toddler misses his nap, try to offer another one an hour or two later. If he skips his nap, try for an earlier bedtime. Offer a high-protein evening snack each night. It can be a part of your routine. An evening snack can help to ward off hunger during the night. Putting a nightlight into your toddler’s room can ward off any nighttime fears. A soft light can offer reassurance while your child sleeps and when he wakes. Some of the latest ones are voice activated and this could also hel reassure your child. 7. Explain in Simple Terms Why! Your toddler might not be able to hold a real conversation just quite yet.They still might appreciate you explaining why she needs to take her naps and go to bed on time. Keep the explanations simple such as, it is important for you to grow while you sleep (or, think of something that your toddler will appreciate and easily accept). Avoid over explaining and the dreaded Why question from your toddler. You don’t want to make this an never ending circle of questions and answers which would defeat the point! 8. Don’t Undo Old Habits! You might think that some habits are for babies, but don’t stop them just yet! If your toddler finds cuddling like a baby comforting, and it helps him to fall asleep, keep doing it before bedtime. Just be sure to place him in his bed and tuck him in before he actually falls asleep to help promote that he is growing up and needs to sleep in his own bed. In other words, try to keep comforting habits while reinforcing new bedtime routines. Just because your toddler is giving you trouble at bedtime, don’t let the boundaries change. Stay firm! An example would be that you do not want them to sleep in your bed every night but to learn to sleep in their own bed. 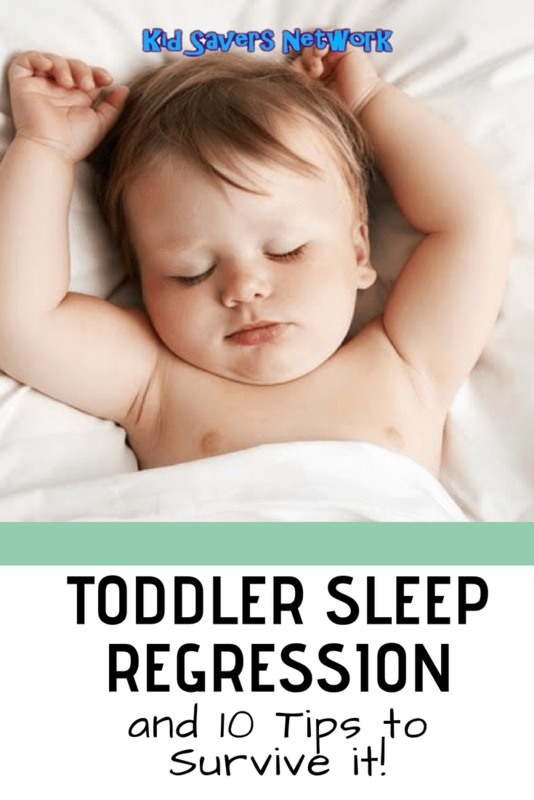 During this regression phase, if you back down and let your toddler sleep in your bed, they might just get used to it (or, realize that he can get his way easily), and it can become an every night issue. Make your boundaries, and consistently keep them! Remember, you created your boundaries for a good reason! 10. Be Prepared To Start Over! 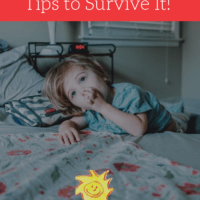 Try to stay on track as much as possible with sleep patterns, but do realize that some things can throw off your toddler real good. Things such as a bad cold can contribute to sleep changes and afterward, you might have to start again with the proper nap and bed times. Also, give the sleep regression several weeks to sort itself out, then try to get back to the norm. 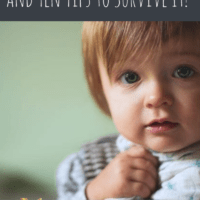 Even if you follow every one of these tips, the most crucial of all survival skills will be your patience! Remember that your toddler’s sleep regression phase in normal, and that it is only a phase. As with all phases, this one too will pass! Looking for other ways to improve your toddler’s sleep? Be sure to check out our pages on Toddler Travel Beds and Nap Mats!